NOAA’s Southwest Florida “Red Tide” Respiratory Irritation Forecast for August 20, 2018. Credit: NOAA. A bloom of the red tide alga, Karenia brevis, currently extends over 100 miles along Florida’s southwest coastline, detrimentally affecting human and marine animal health and the local economy. NOAA’s National Centers for Coastal Ocean Science (NCCOS) plays a major role in conducting and funding research to better understand, monitor, and forecast red tides and other harmful algal blooms in Florida. 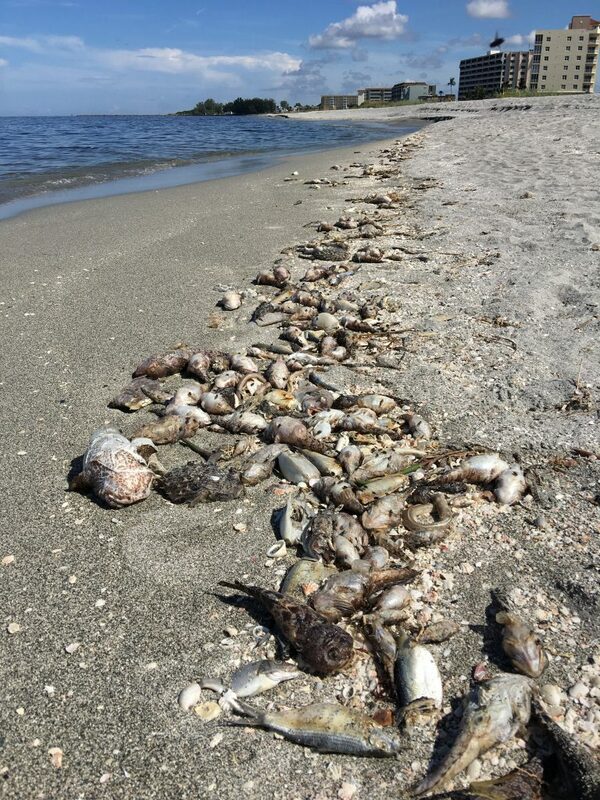 Originating offshore in October 2017, this red tide intensified and moved closer to shore in June 2018, extending 130 miles and affecting seven Florida counties. While red tide blooms commonly occur off Florida’s west coast between late August and November, this bloom is larger and formed earlier than usual, and has remained close to shore for several weeks. The last bloom that occurred this early and persisted this long was in 2005. Many factors control bloom growth and movement, from weather and water conditions to availability of nutrients and the alga’s biology. As these factors are not well understood, predicting the duration of a bloom is difficult. Scientists continue to monitor oceanographic conditions in the region and sample for the presence of bloom organisms to determine where the bloom currently is and where it could move next. Red tide produces brevetoxins, potent neurotoxins that can kill animals and make shellfish dangerous to eat. The current bloom is taking an increasing toll on the region’s marine animals, including fish, sea turtles, birds, dolphins, and manatees. People who eat shellfish contaminated with brevetoxins can become ill with Neurotoxic Shellfish Poisoning. Breaking waves also release the toxins into the air, causing skin, throat, eye, and even severe respiratory irritation. The shellfish and tourism industries are feeling the economic impacts of the bloom the most. Shellfish harvesting closures are necessary to protect human health, while beaches, hotels, restaurants, and charter boats lose customers as people avoid areas with dead fish, strong odors, and air quality warnings. Dead fish on beach near Sarasota, Florida, killed by toxins from 2018 red tide. Credit: Bob Currier, Texas A&M University. NCCOS is the primary federal entity supporting and conducting red tide research in Florida, including developing faster and cheaper methods of detecting algal cells and toxins, improving predictive models, and understanding the impacts on wildlife. NOAA’s Center for Operational Oceanographic Products and Services (CO-OPS) monitors daily conditions and issues twice-weekly forecasts for red tide blooms in the eastern Gulf of Mexico. The National Weather Service uses these forecasts to release a Beach Hazard Statement to the public when the respiratory impacts reach a high threshold. Information on where the bloom is located and a 3–4 day forecast for potential respiratory irritation are available online to the public. 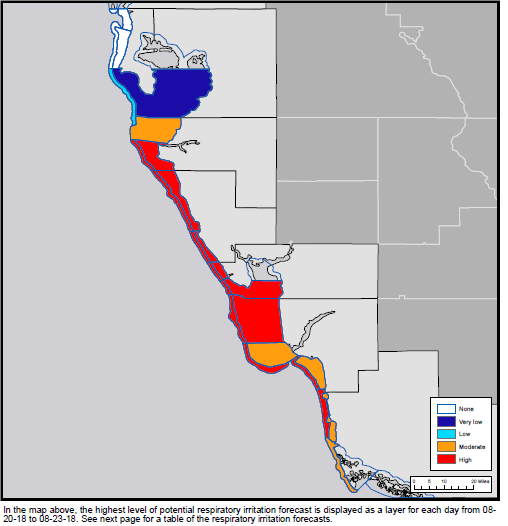 NCCOS developed and validated Gulf of Mexico red tide forecasts for Florida and Texas and transitioned them to CO-OPS for operations in 2004 and 2010, respectively. Hundreds of state and local coastal resource managers, public health officials, and research scientists receive a forecast bulletin providing additional information on the size and trajectory of the bloom, allowing managers to take appropriate actions and focus sampling efforts. With constantly changing winds, not all beaches pose a risk of respiratory irritation on any particular day. NCCOS is working with the Gulf of Mexico Coastal Ocean Observing System and other local partners to increase the accuracy of the respiratory impact forecast to provide a capability for “every beach, every day.” This next generation forecast will use automated analysis and reporting on water samples collected by citizen scientists. It will reduce the impact of red tides on residents and the tourism industry by identifying which beaches within each affected county are safe to enjoy. NCCOS will issue the beta stage of this forecast to resource managers starting in September 2018. Through the NCCOS Harmful Algal Bloom Event Response Program, NCCOS is providing local organizations with modest financial support to defray event response costs, such as mobilization of sampling, supplies, and analytical services. All research efforts and data collected by NCCOS and its partners are critical to predicting and mitigating impacts from this and future events. The tools developed by NCCOS are empowering communities in Florida, and the rest of the United States, to protect their communities and economies with improved harmful algal bloom detection, forecasting, and mitigation. Are Benthic Cyanobacteria a Source of Toxic Blooms and a Threat to Human Health?